Council of Torah Sages instructs haredi MKs, ministers to resign from the coalition if current draft law is not changed. 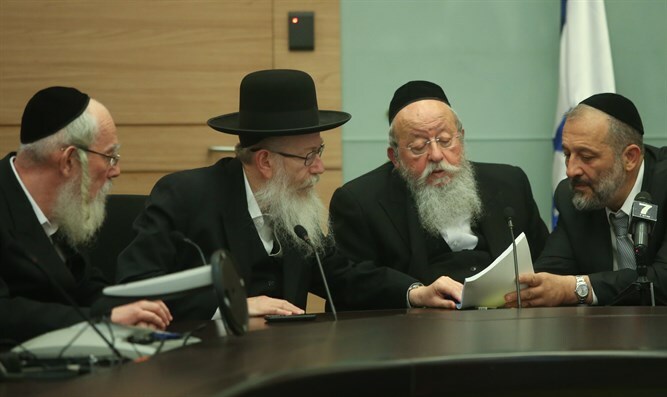 The Agudat Yisrael Council of Torah Sages instructed Deputy Ministers Yaakov Litzman and Meir Porush and MKs Menachem Eliezer Mozes and Yaakov Eichler to resign from the coalition if the draft law is promoted in in current form. The law presented to the members of the Council was prepared by a joint committee of the Defense Ministry for the IDF. The political establishment believes that Prime Minister Binyamin Netanyahu will not advance the law if the haredi parties do not provide their support. As a result, the government is expected to petition the Supreme Court and to request a six-month extension in order to continue handling the legislative process. Last year, the Supreme Court struck down the 2015 amendment to the IDF draft law, ruling that the exemptions it granted to haredi yeshiva students were discriminatory. The state was given one year to develop a replacement for the draft law. Defense Minister Avigdor Liberman said Thursday morning that the current version of the draft law is the best solution to the situation. "The law that was brought is perhaps the most balanced and the only thing that can answer all the problems and all the demands and arguments," Liberman said. "From the start I said that if you want to pass a law, everyone has to give up his private political agenda and build something official," the defense minister said. "Therefore, the law that was presented does not match with my worldview, and certainly not with Deri or Litzman's. This is a law that is really the answer, perhaps the absolute one, to the demands of the IDF."